Jianping Chen – Director General, Shanghai Hospital Development Centre. 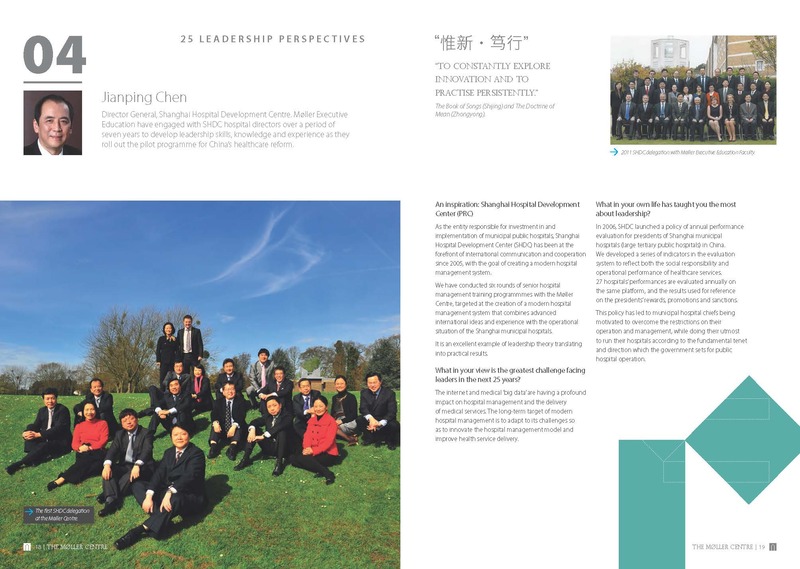 Møller Executive Education have engaged with SHDC hospital directors over a period of seven years to develop leadership skills, knowledge and experience as they roll out the pilot programme for China’s healthcare reform. Shanghai Hospital Development Center (PRC) – As the entity responsible for investment in and implementation of municipal public hospitals, Shanghai Hospital Development Center (SHDC) has been at the forefront of international communication and cooperation since 2005, with the goal of creating a modern hospital management system. We have conducted six rounds of senior hospital management training programmmes with the Møller Centre, targeted at the creation of a modern hospital management system that combines advanced international ideas and experience with the operational situation of the Shanghai municipal hospitals. It is an excellent example of leadership theory translating into practical results. What in your view is the greatest challenge facing leaders in the next 25 years? The internet and medical ‘big data’ are having a profound impact on hospital management and the delivery of medical services. The long-term target of modern hospital management is to adapt to its challenges so as to innovate the hospital management model and improve health service delivery. What in your own life has taught you the most about leadership? In 2006, SHDC launched a policy of annual performance evaluation for presidents of Shanghai municipal hospitals (large tertiary public hospitals) in China. We developed a series of indicators in the evaluation system to reflect both the social responsibility and operational performance of healthcare services. 27 hospitals’ performances are evaluated annually on the same platform, and the results used for reference on the presidents’ rewards, promotions and sanctions. This policy has led to municipal hospital chiefs being motivated to overcome the restrictions on their operation and management, while doing their utmost to run their hospitals according to the fundamental tenet and direction which the government sets for public hospital operation. This is one of 25 Leadership Perspectives in a book published by the Møller Centre to mark its 25th anniversary year entitled Leadership Perspectives. The book, which you can download here, features 25 leaders talking candidly about what they believe to be the greatest challenges facing leaders over the next 25 years.